Ethiopian Jews (‘Falashas’) in Israel have been the subject of persistent racism ever since they emigrated over a decade ago. Many Zionists believe they are not Jews and the Chief Rabbinate insisted they be recircumcised unlike the Soviet Jews. The reason for this is that they are Black. Opinion polls have shown that attitudes to them are virtually the same as that towards Palestinians, with the proviso that they are in Israel as of right, whereas the Palestinians are considered to be guests, there on sufferance. The protest was prompted by a video of a police assault against an Ethiopian Israeli soldier; 10 protesters and three police officers receive medical treatment. Around 1,000 protesters, most of them from Israel's Ethiopian Jewish community, demonstrated in Jerusalem on Thursday against police violence. The demonstration continued into the evening, with violent clashes between protesters and police. 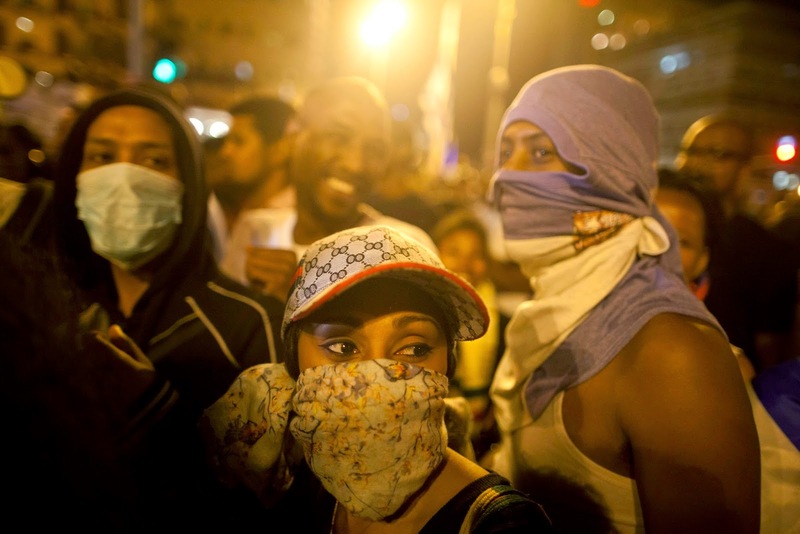 Protesters against police brutality toward Ethiopians in Jerusalem, April 30, 2015. The demonstration in front of the national Israel Police headquarters was prompted by a video of an incident on Sunday in the Tel Aviv suburb of Holon in which a policeman is seen pushing an Israeli soldier of Ethiopian descent, Demas Fekadeh, to the ground after he didn't initially move at the policeman's request. (Police were attempting to clear the area due to a suspicious object.) Another policeman is then shown in the video pummeling Fekadeh. The protest started with a few hundred protesters and grew to around 1,000 by the evening, moving from the police HQ to the center of the city, a short distance from the Prime Minister's Residence. Later in the night, the protesters blocked the intersection between King George St. and Jaffa St.
Israel Police said that forces tried to disperse the protesters, who they said threw stones and bottles. There were also reports of protesters throwing fire bombs. Medical teams treated 10 protesters and three police officers for injuries. 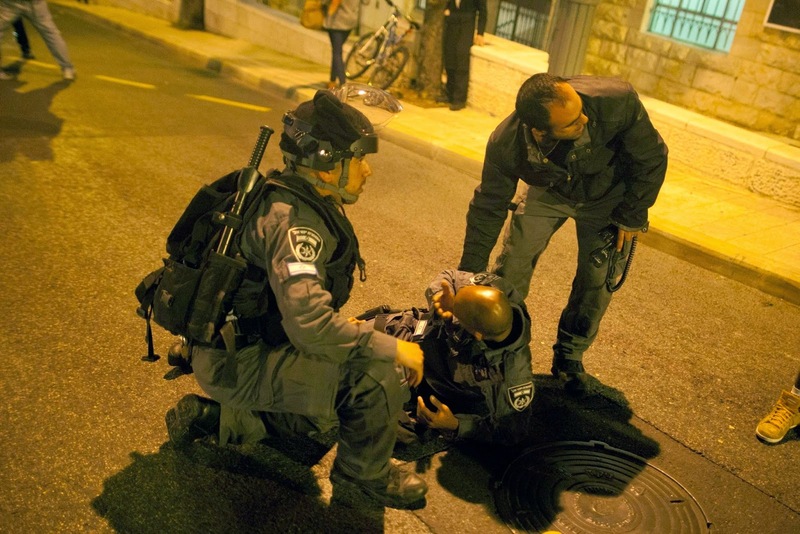 Two police officers and seven protesters were rushed to Jerusalem hospitals for further treatment. Two protesters who tried to attack police were detained. Jerusalem Mayor Nir Barkat arrived at the scene and spoke to the protesters trying to lower the flames. "Do you doubt that the prime minister, ministers, and 120 Knesset members want to embrace the Ethiopian community?" Barkat asked a young protester, who responded "I don't want a hug. Look at me as you would look at a white person. I don't need a hugs. That is a patronizing attitude that says that I'm incapable, so let's give him a hug." Jerusalem Police Chief Chico Edri told the protester leaders that he understood their rage and that the police was going to investigate the grievances raised by the protesters, and work tirelessly to assure that its ranks are not involved in any unethical deeds. Edri called on the protesters not to let the protest get out of hand. Earlier in the evening outside the police headquarters, the forces tried to hold back the protesters to keep open Route 1, a major thoroughfare in Jerusalem, but the demonstrators managed to block the road and also to disrupt movement of the city's light rail line. Periodic confrontations erupted between protesters and motorist who were unable to make their way through the area. Police earlier approached leaders from the Ethiopian community in an effort to diffuse the situation. Earlier in the afternoon, they used mounted officers in an effort to disperse the crowd of demonstrators. The demonstrators protested what they labeled racist conduct on the part of police and called for the police officers suspected of violence to be put on trial. Officials at the Justice Ministry's police investigation division said they have opened an investigation into the incident in Holon. 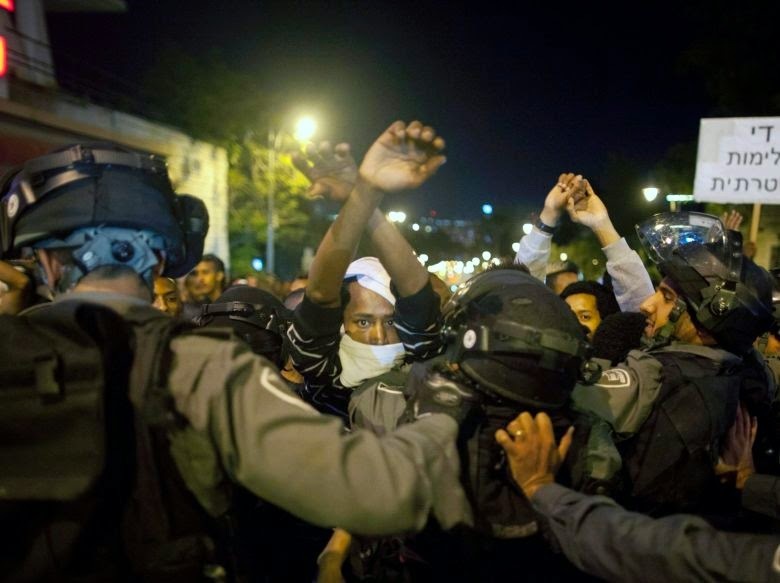 The most extreme recent incident involving a confrontation between police and Ethiopians took place in the northern town of Binyamina last year. In that incident, police used a Taser gun against a 22-year-old Ethiopian Israeli, whom they reportedly suspected of breaking into a house. He was taken to the police station in nearby Zichron Yaakov and was found by his family unconscious and manacled. He died several months later in what police ruled a suicide. 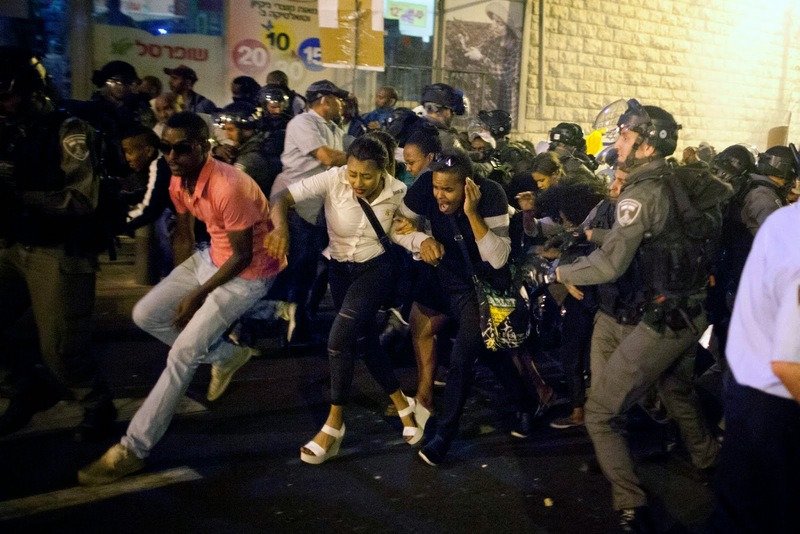 Zionist Union Knesset Shelly Yacimovich condemned the conduct of the police in Holon, and in a Facebook post said the darker one's skin is the greater the racism is. "It wouldn't be far-fetched to expect that if [Fekadeh], the soldier who was hit, was a light-skin soldier, preferably with an Ashkenazi appearance, he would not have sustained harsh blows without consideration from police."